JANESVILLE, Wis. — The high school students clustered around a four-foot-tall red robot with long arms and cartoonish eyes. A so-called collaborative robot, programmed to work with humans at the Prent Corporation, a packaging company, it looked cute, not intimidating. 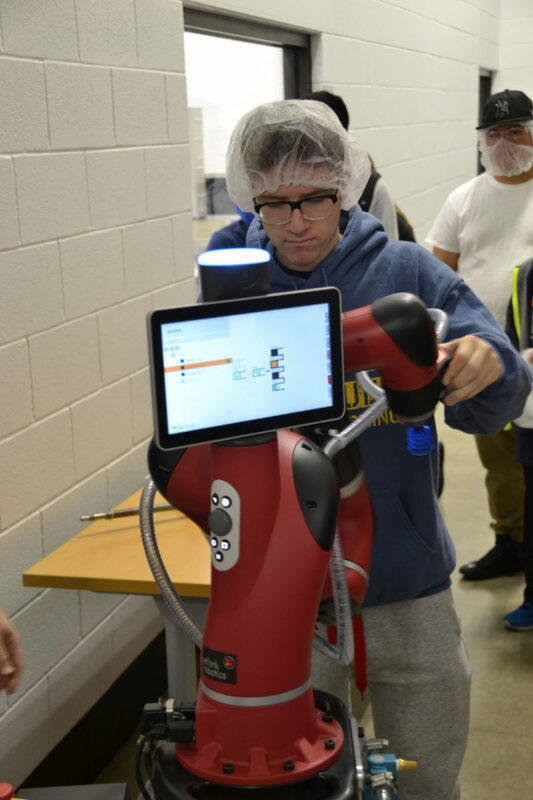 But on this “Manufacturing Day,” which in the last few years has given local high schoolers the chance to don safety goggles and step inside factory walls, the robot delivered a not-so-subtle reminder that their teachers have tried to drill into them: The unskilled jobs that paid earlier generations so well are dwindling, gone offshore and to robots like this one. To compete for the manufacturing jobs of tomorrow, these teenagers will need specialized skills. So study hard. A decade ago, it would have been difficult to imagine this southern Wisconsin city of roughly 60,000 trying to sell its young people on careers in manufacturing. In 2008, General Motors idled the plant that had long kept thousands of Janesville’s residents in the middle class. But after enduring several years of double-digit unemployment, along with higher rates of homelessness and suicide, the hometown of Rep. Paul Ryan has seen joblessness fall to roughly 3.3 percent. Many businesses, some of which migrated to town after GM and its suppliers left, say they can’t find enough skilled workers to fill jobs in manufacturing and the trades. With jobs in the trades going begging and too many kids exiting four-year colleges with crippling debt only to find their degrees don’t have labor-market currency, Pophal says more people need to consider the value of certifications and two-year technical degrees. As part of his plan, Pophal is helping to send teachers back to school for additional training at the local Blackhawk Technical College so they can teach more specialized classes that also count for college credit. 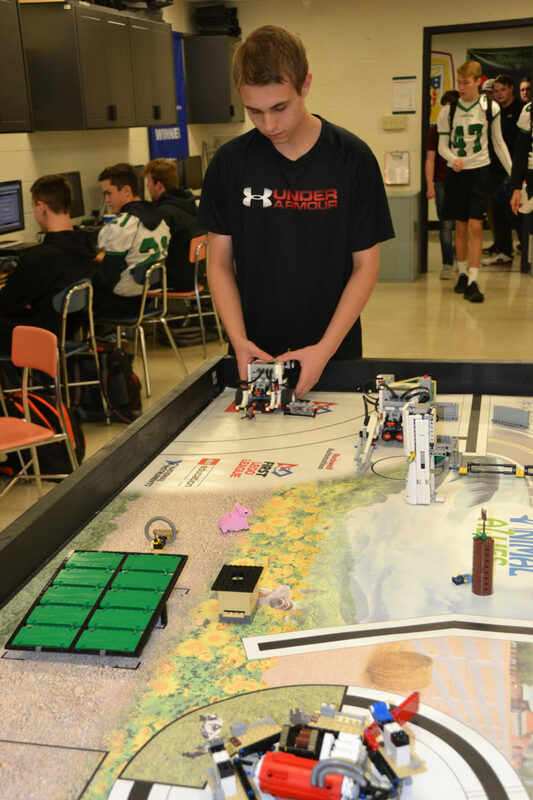 The city’s two traditional high schools are creating programs in mechatronics, a growing field that combines mechanical engineering and electronics; Pophal is also courting businesses and adding more opportunities for workplace learning. And he has brought in an education company to help teachers engage students, rather than lecturing at them. 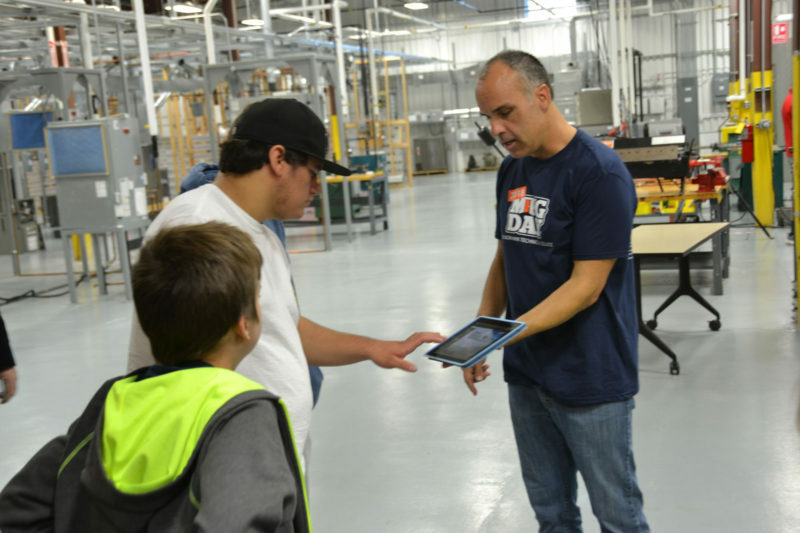 “Having kids sit in rows and learning to be compliant, learning to take direction, that pedagogy prepared kids” for “the manufacturing environment of days gone by,” says Pophal. Indeed, there’s another wrinkle to the changes in the workforce that are making Pophal’s job of selling manufacturing and other technical careers more difficult. While jobs have rebounded, wages are lagging. Some of the skilled jobs he’s steering students toward pay between $16 and $25 an hour — less than the $28-an-hour salaries many unskilled workers were earning at GM close to a decade ago. Statewide, inflation-adjusted median wages were just 0.3 percent higher in 2017 than in 2010, the year Governor Scott Walker won office and began pushing legislation to hobble unions and cut funding for schools. That compares with a 1.6 percent increase nationally, according to the left-leaning Economic Policy Institute. In Janesville, the median hourly wage is $16.98, meaning that half of all workers earn less. That’s complicating the work of educators like Pophal who are trying to prepare students for jobs that demand skills and training while offering a less-certain return on investment. “I say to employers, ‘If I’m going to help you scale up your future workforce, you’re going to have to scale up your living wage opportunities,’ ” says Pophal, who joined the district last year. On a recent Friday at Janesville’s Parker High School, which sits across from a cornfield and serves 1,300 students, marketing and business teacher John Zimmerman was guiding students through a lesson on “tax increment financing.” Imagine you’re a city council member, he told them, and you’re deciding whether to entice a manufacturer to open a new plant in town by offering tax incentives plus infrastructure improvements like a new road. “Is it worth it?” he asked the students as they broke into small groups to do the math. Down the hall, computer science and robotics teacher Bob Getka was teeing up students to program a code calculating the commission salespeople would earn. A bear-like man whose classroom is ringed with photographs of every one of his roughly 350 former students who passed the AP computer science exam, Getka asked the class if any of them had completed a practice coding session at home. These classes demand the sort of interdisciplinary and real-world thinking that Parker High is trying to encourage as it rolls out a program to help all juniors and seniors home in on job-linked areas of study such as health and human services; business, administration, marketing and arts; and technology, engineering, agriculture, manufacturing and science. That aligns with a state mandate, implemented in the 2017-18 school year, that all students infuse their academics with career planning. If Janesville had a prototype for the sort of “sophisticated consumer of education” it hopes to mold, it might look something like Aidan Brown. A Parker High senior, Brown has decided against following his older brother to a four-year college. Instead, he’ll continue working at the local construction business where he now earns $15 an hour on weekday afternoons and weekends through an apprenticeship he arranged himself with help from teachers. He also plans to take night classes toward a two-year business degree at Blackhawk Technical College with the goal of opening his own construction business. That’s starting to change, he says. For Pophal, that change can’t happen quickly enough. But his job is also complicated by Janesville’s spreading poverty. 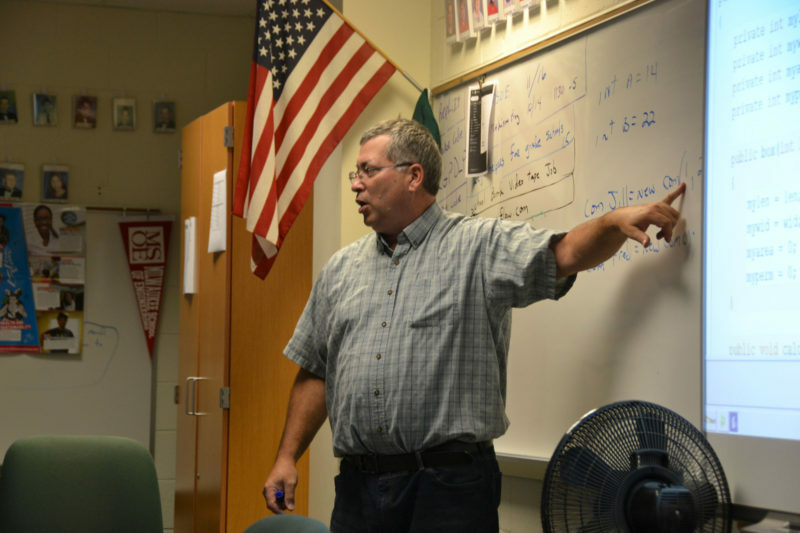 Although Brown’s family accepted his chosen career path once they saw him spending long hours on carpentry projects in the garage, school principal Chris Laue says that not every kid gets that support, because their parents are too busy juggling multiple jobs or lack experience with college applications and career planning. Half of students in Janesville schools qualify for free lunch, nearly double the share when GM was still operating, according to Pophal. 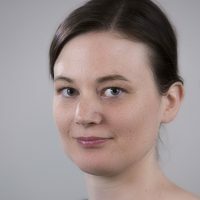 At ECHO, the local food bank, a majority of clients hold jobs — sometimes two or three — but still can’t afford basic necessities, says Jessica Locher, associate director. Speaking on a recent Friday as she waited in the food bank to pick up her bag of groceries, Michelle Nicoson said she was counting on her boyfriend earning a degree from Madison Area Technical College. The Parker High School graduate has a certificate in dialysis, but is staying home right now with her two young children. Nicoson said a degree would help her boyfriend boost his $16-an-hour wage as a steamfitter into a much more comfortable salary. Barry Brandt, who owns a local heating and air conditioning manufacturer called Lanair Products, says he recently raised pay for unskilled workers on the assembly line from $11 to $14 an hour. Skilled employees at the company, like welders and machinists, earn between $20 and $25 an hour, he says. The wage increase has made it a little easier for the company to retain workers, but Brandt says it’s still a challenge to find people with a strong work ethic, who show up each day and have the necessary communication skills. Conventional economic thinking suggests that in a tight labor market, wages will go up as businesses compete for workers, as they did at Lanair. But workers have less power now, seven and a half years into the aggressively anti-labor Walker administration. And schools trying to prepare students for the new economy, like the ones in Janesville, are forced to make tough budgetary choices. Education has emerged as a central election issue as Walker runs for a third term this November. The Democratic candidate, state school superintendent Tony Evers, is polling within a point of Walker on a platform to boost school budgets, raise the minimum wage to $15 an hour and prepare kids for “21st-century jobs.” He is hammering the Republican governor’s cuts to schools and universities, which totaled more than $1 billion between 2011 and 2017. Rather than doubling down on austerity, however, Walker signed a budget last year to increase school funding by $649 million and is now calling himself “the education governor.” But that’s not enough for some school systems, which have turned to raising property taxes through referendums in order to repair buildings and keep services running. Sixty-one districts are asking voters this November for roughly $1.4 billion in funds. In Janesville, Pophal says he has been able to fund some of his programs with private philanthropy and state grants, and the district has gotten creative about raising money in other ways. Since 2013, Janesville has been recruiting tuition-paying students from China to shore up its budget, for example. Still relatively new to the job, Pophal says that before turning to a referendum he wants to make sure there’s nowhere left to cut. At the same time, not everyone agrees that it’s the job of schools to give students workplace expertise — or even that a so-called skills gap exists. Peter Cappelli, a professor of management at the University of Pennsylvania’s Wharton School, says there’s no evidence of a growing gulf between what workers can do and what businesses need. Rather, he says, businesses could solve their workforce problems if they would simply pay people more, relax their rigid hiring practices and invest in workers. Still, many are willing to make sacrifices if it gives their students a brighter future. Back at Parker High, teacher John Zimmerman is a half hour into his lesson on tax increment financing. He gets excited when he reveals that the assignment had a real-life inspiration: a Janesville city council decision in the early-2000s to help refurbish a road with the goal of persuading the still-kicking GM plant to stay put. “That was a pretty nice road and all of a sudden GM closed,” says Zimmerman. But like a lot of people here, Zimmerman still manages to zero in on the positive. That road might not have paid off with GM, he says, but it could help keep other businesses contented — and lure new ones. *Correction: This story updates the title of Julie Underwood, a professor and former dean of University of Wisconsin-Madison’s School of Education and clarifies the professional development teachers are receiving through Blackhawk Technical College. This story about middle-class jobs was produced by The Hechinger Report, a nonprofit, independent news organization focused on inequality and innovation in education. Sign up for the Hechinger newsletter.